What kid of the ’80s didn’t see himself as Luke Skywalker, valiantly manuevering his X-Wing fighter down the Death Star trench, the fate of the whole galaxy resting upon him and his loyal astromech droid? Seeing as most of those ’80s kids probably have an iPhone now, we imagine that THQ Wireless didn’t even consider the odds of successfully navigating an asteroid field when producing the $5 Star Wars: Trench Run (iTunes link). The iPhone game is kind of like a “special edition” of the classic Star Wars arcade game, dropping you into Red 5's orange flight suit at the pivotal Battle of Yavin. You can engage waves of TIE Fighters over the surface of the Death Star or make the legendary trench run to nail the small thermal exhaust port (right below the main port). 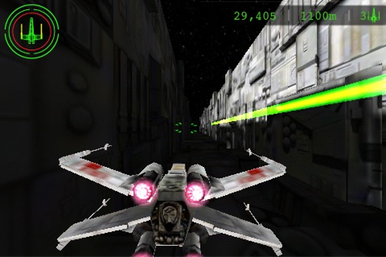 The controls use the iPhone’s accelerometer to steer the ship and you tap various parts of the screen to fire the X-Wing’s weapons, toggle between cockpit and third-person camera modes, or activate a slow-motion feature (presumably, the equivalent of using the Force). The Mission Mode incorporates scenes and dialogue from the movie while the Arcade Mode lets you choose from the trench run or dogfighting. Both make great use of authentic Star Wars sound effects and John Williams's soaring score. You'll need an iPhone or iPod touch running iPhone OS 2.2.1 or later, and apparently the game is optimized for different devices, providing extra graphics on the iPhone 3GS and second-generation iPod touch. Of course, as Macworld’s resident Star Wars fanatic, I was legally obligated to download the game and give it a run. The game sports a variety of different difficulty settings ranging from Easy to Jedi. The accelerometer controls make it flying pretty challenging, despite the fact that I used to bullseye womp rats in my T-16 back home. Even on easy, I found myself crashing into trench walls or getting turned into a cloud of vapor by a passing TIE fighter, so clearly I am not a Jedi yet—hey, reckless am I. While Star Wars: Trench Run may not be up to the gold standard set by LucasArts’s venerable X-Wing series, I’d rank it as at least as fun as a visit to Tosche Station. Now let’s blow this thing and go home.